Jim Progris is one of the most highly acclaimed jazz piano authors and respected educators of our time. As a long standing faculty member and Music Merchandising department head from the University of Miami’s outstanding program, Jim brings a wealth of knowledge to all. 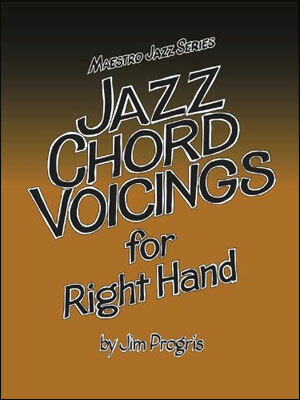 Jazz Chord Voicings for Two Handswas the first of its kind when originally published in 1982 by Hansen House. Revised and brought up to industry standards then re-released after two decades by Santorella Publications, it is still the absolute best source for learning jazz piano chords for two hands. 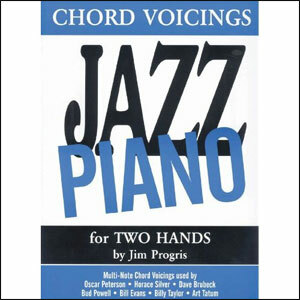 A brilliant jazz pianist of his own right, Mr. Progris outlines hundreds of two-hand jazz chord voicings and numerous explanations on their construction. Excerpts from typical jazz piano arrangements have been included to show how they are used in practical application. Referencing the styles of Oscar Peterson, Horace Silver, Dave Brubeck, Bill Evans, Art Tatum, Bud Powell, Billy Taylor, Fats Waller, not to mention the style of his own. It is highly recommended to master certain basics in Jazz Chord Voicings For The Right Hand * LV020,before attempting to study this book for two hands. There are simply no other jazz piano products that can compare to these two remarkable texts. A mandatory must for any serious jazz piano student, educator, novice or professional.